For Maria and Paul Williams, the giving began with a gift, twin daughters born 34 years ago when the couple was first starting their family. Their daughters, Laura and Rachel, have Down syndrome, and their births marked the beginning of Paul and Maria’s journey in parenthood as well as their journey in stewardship. While Maria was still in the hospital with the girls, the Williams discovered that there was very little community support for families like theirs. Representatives from a parents’ support group in Montgomery County, Pa., came to visit them, but there was nothing similar in South Jersey. Once home with their new daughters, Maria and Paul quickly found other families whose children have Down syndrome and began a support group that met in each other’s homes. Their fledgling efforts eventually evolved into BUDS (Bringing Up Down Syndrome), an organization that has supported hundreds of families of individuals with Down syndrome in the South Jersey region for over three decades. That was only the beginning. The Williams family began to grow, with the addition of son Jason and daughter Audrey. 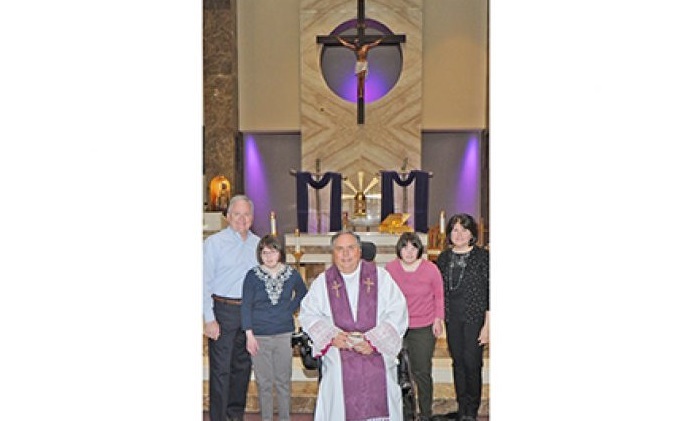 And amazingly, in the midst of the hustle and bustle of their busy family life, Paul and Maria found themselves giving more to their parish, Saint Andrew the Apostle in Gibbsboro, pastored since 2010 by Msgr. Louis Marucci. Today, at Saint Andrew, Paul and Maria are practically indispensable parts of the busy life of the parish. With dozens of committees and some 1,500 volunteers, Saint Andrew is a parish that requires many hands. Paul serves as a trustee of the parish and has worked closely with Msgr. Marucci for the past five to six years to provide oversight for critical parish operations, especially in the areas of finance, and building and maintenance. Parish committees overseeing these functions are fortunate to have the more than three decades of engineering experience that Paul brings. His expertise as a project manager is much needed at Saint Andrew, a parish whose facilities allow them to sponsor programs throughout the year, frequently hosting speakers and events that are open to the diocese and wider community. Maria brings her leadership skills to the Christian Cupboard, a parish outreach ministry that provides food for people throughout the local area, with the help of about 20 volunteers. The pantry is stocked through two major food drives each year, and the committee mobilizes for three major distributions each year, at Thanksgiving, Christmas and Easter. Each distribution reaches around 90 families. In addition, the ministry operates an on-site food pantry that coordinates a monthly distribution helping about 30 families. Maria represents the Christian Cupboard as a member of Saint Andrew’s Compassionate Outreach Ministry Board which sponsors a wide range of other initiatives that touch the local community, including a prison ministry, a veteran’s outreach and a clothing ministry. The Compassionate Outreach Ministry received special recognition in 2018 when its members received the Disciples of Mercy Award given annually by Catholic Charities in the Diocese of Camden. Maria and Paul were present in Atlantic City for the awards banquet honoring the committee members and their work in the community. As Paul points out, Maria is a talented and dedicated person who brings “great management and organizational skills” to the task of running the food cupboard. She redirects the skill and care that she has used in managing their home and uses that to help others. Building community is the thread that runs through all of life for the Williams so, not surprisingly, they see a call to help others and build community at the heart of all stewardship. And for Msgr. Marucci, stewardship is foundational to Christian community. “As a community, we recognize that stewardship is not a program; it is a way of life.” He also makes it clear that stewardship is, at heart, very personal, as well. “Stewardship begins with a personal and intimate relationship with Jesus Christ, who reminds us of our own identity as beloved sons and daughters of the Father. Perhaps most importantly, the Williams have passed their habit of good stewardship to all four of their grown children, each of whom continues to volunteer in their local communities. Daughters Laura and Rachel still live at home, and when they’re not at work or training for the Special Olympics, they volunteer regularly at Virtua Hospital. As newborns, these two girls inspired their parents to give, and now the whole Williams family has made a legacy of generous giving of their time and talents to others. The mission of the Office of Stewardship is to help the disciples of Christ who live in the Diocese of Camden to live out Christian charity in a sacrificial way that “we might understand the grace that comes from giving back from our blessings so that in all things God may be glorified.” For more information, contact Deacon Russell Davis at 856-583-6102.